I can't believe they said this. I'm so glad these Republican yahoos are holding press conferences to spout their ignorance. The public really needs to see what kind of people we have running the House today. "Let the illegal aliens pick up the trash along the highways" instead of community service prisoners, then. OK, so that was three things. So arrest me. Besides, laws aren't meant to be enforced if enough people ignore them. First, they probably would pick up the trash along the highways if we would pay them a fair wage. Second, the idea of using prisoners to pick fruit would be an unprecedented use of forced labor to benefit a private enterprise - unprecedented at least since the time of slavery and indentured servitude. That is unless Dana Rohrabaher and his supporters are really communists and are calling for nationalization of our agricultural industry. Now as to the marchers, no, of course they were not spontaneous. These people don’t pay that close of attention (or any at all) to what is going on in Washington. They had to be riled up - in this case by Spanish-language radio stations. But once aroused, the crowds are responding angrily to what they perceive as an attack on their heritage and their worth as human beings. This business of carrying the Mexican flag, which has gotten many on the right riled up, is no different than those good ol’ boys down south running around waving the Rebel flag from the back of their pickup trucks. It’s a symbol of defiance and cultural pride mixed into one, not an attack on the U.S. Finally, I think there is a valid comparison between these protests and the ones for Civil Rights for blacks. In each case, you have a large segment of our society that is or was used for cheap labor, that has subsequently been left disenfranchised. In one case, the cheap laborers were forcibly brought to this country, in the other case they came on their own. Either way, they are here to stay whether we like it or not. I had heard about this website before but just today decided to check it out. It seems kind of morbid, but it is really quite facinating. Just check out the list of people still living who are 85 and above. You will be surprised to learn that some people on the list are still alive, and shocked to learn that other people are that old. John Kenneth Galbraith (97) The New Deal economist and prolific author of popular books on economics. I own a large collection of his works and got to see him in person when I was in college when he was touring around the country doing one-on-one debates with William F. Buckley. Michael DeBakey (97) The famous heart-transplant surgeon from Houston. Dolores Hope (96) The widow of Bob Hope who died a few years ago at age 100. Karl Malden (94) The actor who was Michael Douglas’ older partner on the hit ‘70s cop show Streets of San Francisco. Studs Terkel (93) Another prolific author and interviewer whose many works have found a place in my library. Milton Friedman (93) Nobel Prize winning economist and proponent of right-wing free-market theories. Is in a contest with Galbraith to see who can outlive the other. Lady Bird Johnson (93) Beloved former first lady and widow of LBJ. Former President Gerald Ford (92) He made news recently when he went to the hospital with a touch of pneumonia, but he apparently pulled through and is back out on the golf course. Harry Morgan (90) The actor who portrayed Col. Potter on the M*A*S*H TV series. Sargent Shriver (90) Democratic vice presidential candidate who married a Kennedy and became father-in-law to Arnold Schwarzenegger. Augusto Pinochet (90) Facist dictator of Chile. Eli Wallach (90) Actor who played Tuco (the Ugly) in The Good, The Bad and The Ugly. The list of Octogenarians is equally interesting, but I am out of time for now. Sometimes it amazes me what people can do with the Internet. Yesterday somebody noticed this picture on the web site of a Republican running for Congress in California. 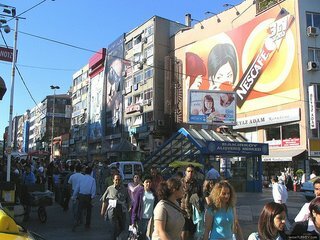 The guy claimed it was a picture of downtown Baghdad and went on to say that it demonstrates that media reports of chaos and turmoil there are overblown and just flat wrong. But then some people on the web started looking more closely at the photo. 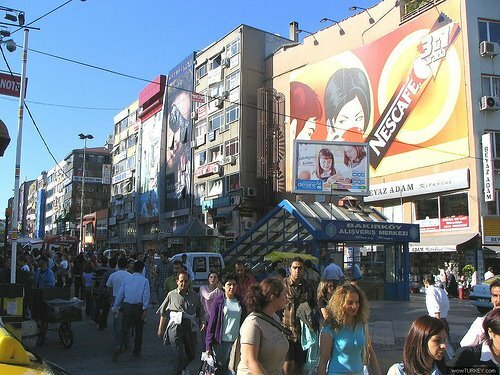 They noticed a conspicuous absense of Arabic on any of the visible signs in the photo. They note that the girl in the picture is not wearing a head scarf and even more scandalously is wearing a strapless dress! 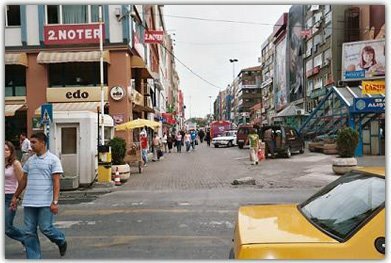 Soon there were allegations going around the web that the photo was not of Baghdad. But where is it and how could you ever prove it? Well, amazingly, earlier today someone over at Daily Kos tracked down a photo of the same street scene from a slightly different angle making clear that the scene is not that of wartorn Baghdad, but a peaceful suburb in Istanbul, Turkey. Needless to say, the lying Republican (is that redundant?) was forced to pull the picture off of his web site. I’ve picked up a lot of new music recently including the new albums by the Rolling Stones (A Bigger Bang), Paul McCartney (Chaos and Creation), and Bruce Springsteen (Devil in Dust). I also finally picked up the latest U2 album that won all of the Grammy Awards. But even with all this new music, I find myself turning everyday to listen to a long-gone band from the early ‘70s that I discovered recently when perusing the record section at my local public library. 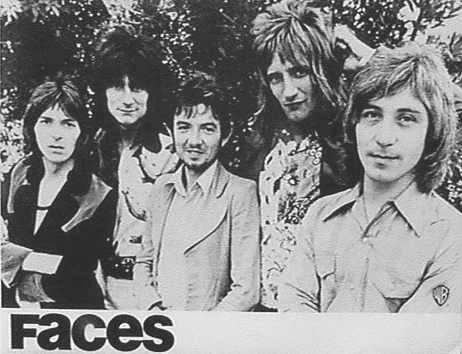 I found a four-disc compilation of The Faces, a short-lived British band that featured frontman Rod Stewart and lead guitarist Ron Wood, and I’ve been completely blown away. The music is fun, catchy and rocks harder than I expected when I first picked it up. I already had a copy of Rod Stewart’s “Every Picture Tells A Story” which was recorded about the same time with many of the same band members, so this collection is like finding a treasure trove of material in that same vein. The Faces could be described as the second-best bluesy early 70s English rock act - after the Rolling Stones, of course. It’s given me renewed respect for Rod Stewart and especially for Ron Wood, who I had previously only known as the latter-day replacement with the Rolling Stones. It’s a shame they didn’t stick together longer, but sometimes the creative spark only lasts a short time and then everyone has to go their separate ways to find new inspiration. President Bush is shaking up his staff as expected and the first to go is Chief of Staff Andy Card. ...his stewardship of the Bush team had come under question in recent months after a series of mishaps, including the failed Supreme Court nomination of Harriet Miers, the slow public disclosure of Vice President Cheney’s shooting accident and the unexpected Republican revolt over a plan to turn management at a half dozen ports to an Arab-owned company. And that doesn’t even mention the things that have really made Bush unpopular this year such as the neverending quagmire in Iraq or their bungled response to Hurricane Katrina. Bush has tapped budget director Josh Bolten to step in and take Card’s place. Think Progress notes that during his time as budget director, Bolten watched the federal deficit grow by $1.8 trillion. “In the Bush administration, this is grounds for a promotion,” they conclude. Are the rights outlined in our Constitution only for Americans? That is apparently what Supreme Court Justice Antonin Scalia believes. Certainly, there are some rights and obligations that go along with citizenship, such as the right to vote and the obligation to pay taxes. But that is not what is at issue with the detainees at Guantanamo. Here we are talking about more basic rights, such as the right to a fair trial and adequate legal representation; the right not to be held indefinitely without charges; and so forth. It would seem to me that when our forefathers were drafting the Constitution they had in mind certain inalieanable rights of mankind - all of whom were created equal, you might recall - and that these rights were not something Americans were just going to bestow upon themselves, but rather it was a philosphy of how one should view fellow men throughout the world. This idea that the prisoners at Guantanamo have no rights because they are not Americans is to me a betrayal of the values that we as Americans take such pride in. For a comparable analogy, imagine a Christian who believes that the only people they have to show Christian love to are other Christians. Non-Christians they can treat like garbage and it is OK. The way we have treated the prisoners at Guantanamo is a disgrace and a betrayal of our core American values. We are a less worthy nation in the eyes of the world today because of Gitmo and Abu Gharib. I just hope the other members of our Supreme Court see things differently than Scalia.